After years of cruel rule under their canine masters, a highly trained squad of Pigs has come together to take revenge. They need a com­mander. They need you! With your help the Pigs will fight for their free­dom! Aim your cannon carefully and navigate your pigs to crush the enemy and get the key. Fly around with Tomo, the jetpack pig or go underground with Hugron, the burrowing pig to solve the amazingly fun PUZZLES. Use the different pigs abilities to CRUSH the wolves and liberate captive Hugo, known as "Pig the Great". Explore 45 levels in two different themes! 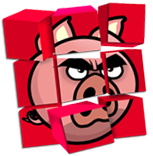 Many more Avenger pigs with amazing powers coming soon! Hundreds more incredible levels coming soon! Watch blocks, pigs, wolves and birds crash and smash! Watch lasers and conveyor belts move and flash! The full version of the game allows you to build you own levels. Add obstacles, springs, pigs, and scenery. Save your levels and play them instantly to your phone. Your imagination is the limit. Recreate famous landmarks, battles, or your wildest dreams. Playful Physics Engine - Watch blocks, pigs and wolves crash and smash!